Deep pockets and pocket neighborhoods: Should we be nervous? Will East Main Street resemble an ocean dead zone or a military checkpoint? Will the Carpenter Building survive? Tune in tonight at as City Council votes on the new Durham Police Headquarters. So far, the architect's five options exceed the proposed budget ($81 million compared to $62 million), yet still fall short of what's architecturally possible on this four acres of primo real estate. The city and the architects have cited security concerns, the need for parking, the cost of saving the Carpenter Building ($4 million), yada, yada, yada, as restrictions on their vision for the site. Meanwhile, Preservation Durham and Durham Area Designers met with the City last week about their proposed hybrid plan that by my reckoning, makes sense from an urbanism standpoint and saves the Carpenter Building, while addressing DPD's security concerns. "The headquarters will be the physical embodiment of the DPD and its relationship with the community," writes Preservation Durham on its website. "If impenetrable security, large 'defensible zone' setbacks from public streets and private development are the primary design criteria, then East Main Street is clearly the wrong site for these buildings." In other words, let's not allow the building reflect the personality of Chief Jose Lopez, whose public persona, anyway, is defensive. (I've met Lopez in private, and while he can be more amiable, he's definitely touchy.) The relationship between city police and Durham, especially communities of color, is tense. A building that embodies and amplifies that tension is unlikely to function as a gateway to East Durham. Under the Preservation Durham/DAD proposal, more than 55,000-square-feet of private development, including the Carpenter Building, and open space—not DPD HQ—would flank East Main and Ramseur streets, which addresses the dead zone issue. The sale of this portion of the property could also help offset the budget overage. DPD and the parking garage is situated in the interior of the development, yet has some buffering via parking and open space to assuage security concerns. 1) It was one of the first car dealerships in North Carolina. (For a while in the 1920s and 1930s, this was auto row: Down the street, the Durham Housing Authority is in an old Ford dealership.) "The fact that these buildings are not listed in one of our historic designation lists is an oversight, not a reason to raze them," PD writes on its website. 2) A private developer could rehab the building more cheaply than $4 million, particularly if it could be listed on the National Register of Historic Places, which qualifies it for federal tax credits. 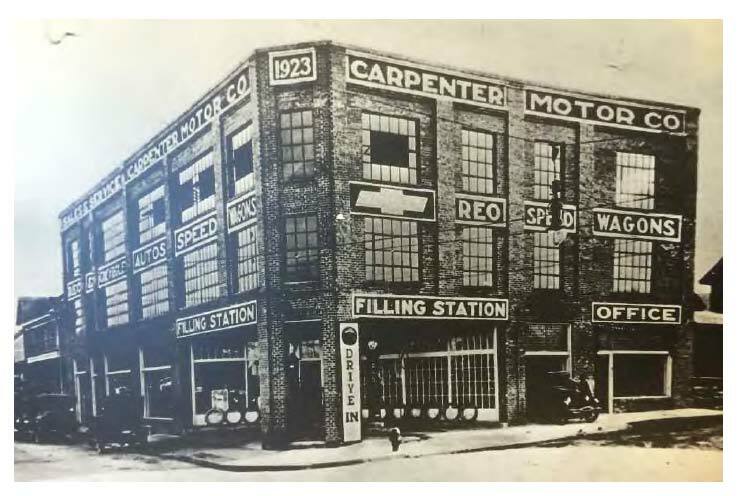 3) Incorporating the Carpenter Building into other retail, residential, restaurant uses on the site will help connect underserved East Durham, which is so close, but feels so far away, with prosperous downtown. Read the most recent chapter of the saga before attending tonight's meeting. It starts at 7 p.m.
Only in Durham could an ugly old car dealership building hidden under a layer of dirty white paint be considered ground zero for the $4,000,000 fight to assure the buzzword of "historic continuity" on Main St. Do we really lack other interesting examples of architecture to protect that we need to pitch a fight over the Carpenter Building? Im all for the private development component and more open design, but millions of dollars to save a derelict old car dealership seems like a tremendous waste. 80 or so years from now will Preservation Durham fight to save the Mark Jacobson Toyota dealership? It's the site of the 57th car dealer in America to do commercials holding a small white dog. Revolutionary. We better get it registered in their historic site list now to avoid any future "oversight" so the city can start setting aside money for it now. @BullCityKitty123: I think that what DAD/Preservation Durham is proposing is to allow private redevelopment of the Carpenter Bldg. -- not incorporate it into the DPD HQ. So, it would be private developer money (aided by tax credits) to rehab it. One of the nice things in the DAD proposal is maximizing the amount of private development on the site, both along Ramseur (connected to future light rail) and along Main St. That keeps the DPD HQ, which is not really much of a public building, focused to the interior. Seems better for "safety" and for street-retail and connections, no? I guess the question would be whether the DAD proposal costs more to build than the City's existing plans -- but given the revenue potential from having more redevelopment land, it seems like a worthy move. Stating the obvious, if the DPD wants to be walled off from the world for security reasons, then why put it on such a central-ish downtown parcel that ought to be developed for economic vitality to the area? The idea of shops surrounding the building is a great one, IMHO. Must we relearn the lesson from the building down the road? @Bullcitykitty123: I don't know whether anyone will want to save Mark Jacobson Toyota in eighty years, but there is a tremendous difference between the commercial buildings being constructed today, and the ones of eighty years ago. Eighty years ago, buildings typically had a local (or occasionally a national) architect who designed a unique building. Today a few firms develop plans and everyone copies them. So all the big box stores look pretty much the same, as do the grocery stories, convenience stores, motels, etc. Look at the apartments being built in Durham; they all look more or less the same with slightly different rouge and lipstick on the exterior. And public buildings are frequently not much better. When they are not just weird ( e.g., Durham City Hall), they are as generic as you can get (e.g., the County jail). Diane Catotti asked the police station architect whether the Carpenter building was an "architectural gem." He dutifully answered "no." A better question is whether the new police station will be an architectural gem. I'd like to save the Carpenter building if, for no better reason, than to hide what's going to be built behind it. "Only in Durham could an ugly old car dealership building hidden under a layer of dirty white paint be considered ground zero for the $4,000,000 fight to assure the buzzword of "historic continuity" on Main St."
You don't get out much apparently. Speaking from Richmond, we can't have more than one closet in our house because of historic preservation covenants that the city has. These preservation fights are pretty universal. "Only in Durham" indeed. Also, it would be one thing if there were no future for a building like this, but the rather insane amounts of money being spent to refurbish similar buildings elsewhere in downtown pretty well document the demand for these kinds of spaces. Governing is about choosing, and you can choose a lot for $4 million. Personally, I think there are many things listed in the city's Capital Improvements Plan that are more important than the Carpenter Building. The Police Department should have a nice, modern, and safe place to work, but the $81 million price tag is a lot to swallow when there are so many other things that need doing in Durham. Whatever is running up the price - including the Carpenter Building - deserves a close look from the Council. The choices they make will be with us for a long time. It's not a binary choice! Preservation Durham/DAD's proposal is for the City to sell the building to a private developer rather than incorporating it into the police headquarters. Council delayed their vote last night to find out more about that very possibility (and the others raised in the PD/DAD proposal). Governing is about gathering all data points and viewpoints and making the best decision with that information at hand. It's almost never as black-and-white, this-or-that as you make it out to be.